Kitchen shears are one of the best tools that can do cooking and preparing food a whole lot easier. Are you on the lookout for the best kitchen shears? Well, you will be happy to know that this article is created to help you find one that will suit your needs. 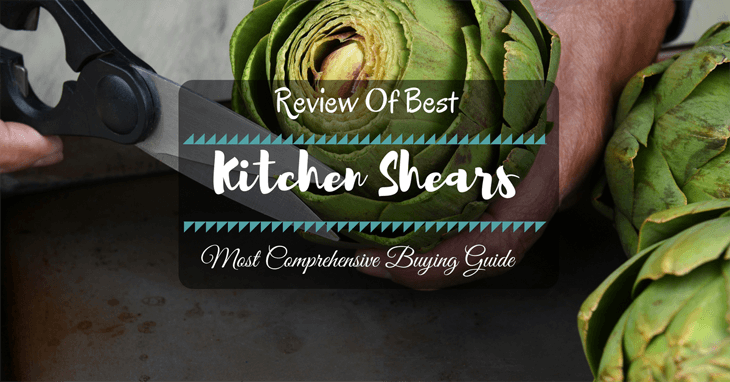 Why Should You Buy Kitchen Shears? 1. 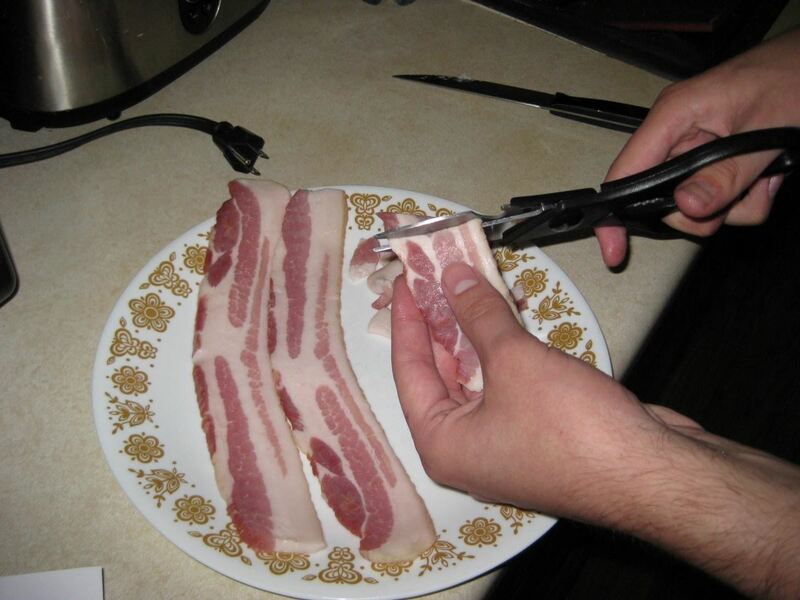 Cutting meats and other food ingredients without the need for chopping boards. 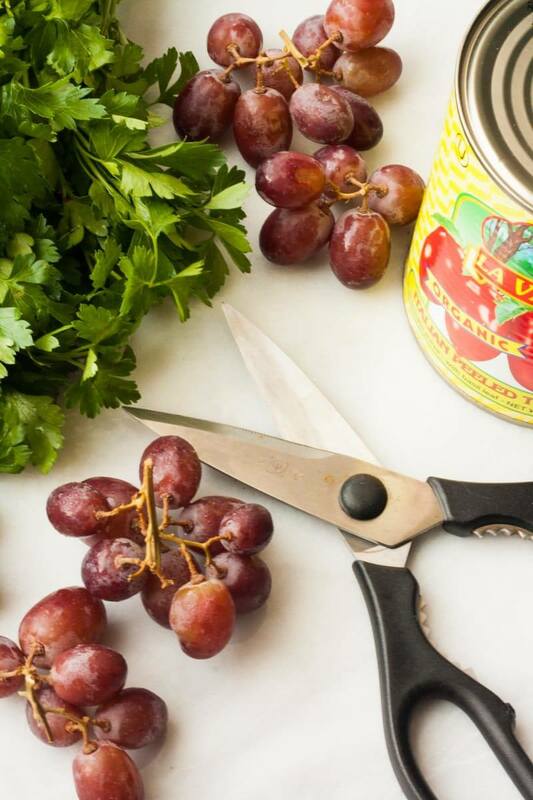 If you are in a hurry, kitchen shears can help you prep up dinner in the fastest and most hassle-free way possible. If you are using a knife to cut meat, herbs and the likes, it will take time plus you will also need to use a chopping board. With kitchen shears, you just have to pick the food ingredient and cut it with no need for chopping boards. No pizza cutter? No problem! 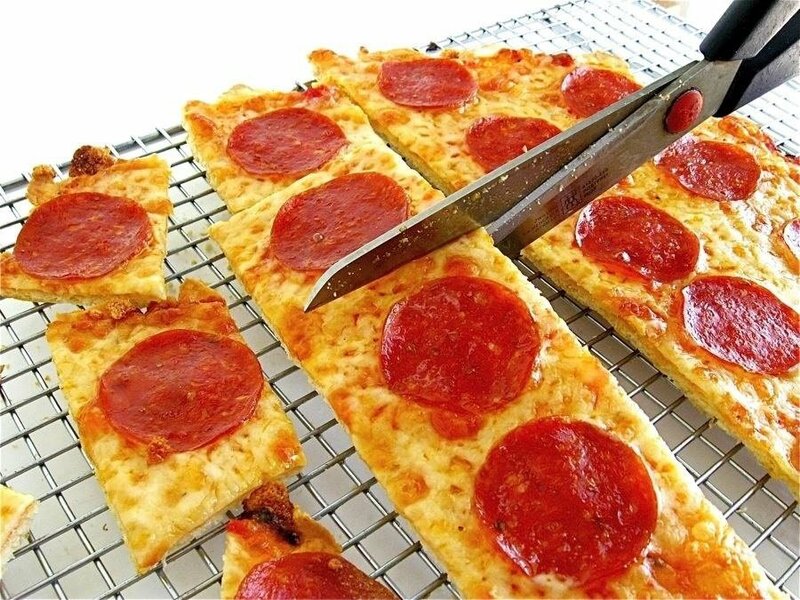 You can just simply use kitchen shears in slicing your pizza into bite-sized or smaller pieces without leaving any mess behind. 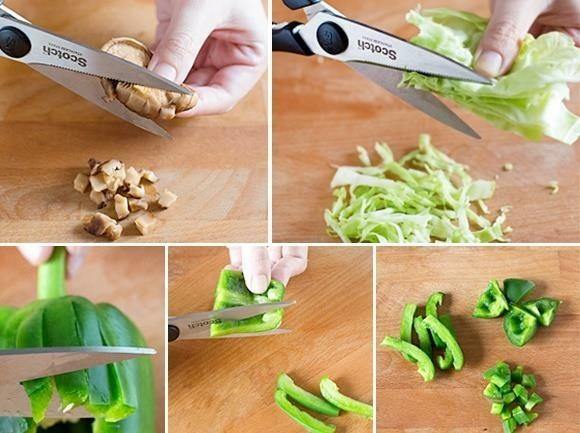 If you are cutting bell peppers, cabbages, and lettuce, a knife may not be the best option. A kitchen shear can do the job a lot faster and more efficient. 4. They also offer plenty of functions other than cutting stuff. If you think that kitchen shears are just for cutting, think again. Today, you can find kitchen shears that offer a variety of functions. There are some that have metal inserts on their handles that can remove screw caps on bottles while there are some that can open up jar lids and crack nuts with ease. What Qualities to Look for in Kitchen Shears? 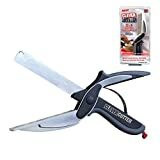 So now that you know how important it is for you to have kitchen shears in your cabinet, you will surely want to find the best one for your needs. To do that, you have to familiarize yourself with what are the qualities that a good pair of kitchen shears has. Well, you do not have to do your research because we have already done it for you! Below are some of the things that you should look for when buying kitchen shears. Just like in any product, the material used in manufacturing the item matters.. a lot! For your information, kitchen shears are usually built using two types of materials: stainless steel and carbon steel. Among the two, it is carbon steel that has a sharper and better edge plus it is also easier to sharpen. ​However, this material has a high tendency to rust, and it can be quite expensive. 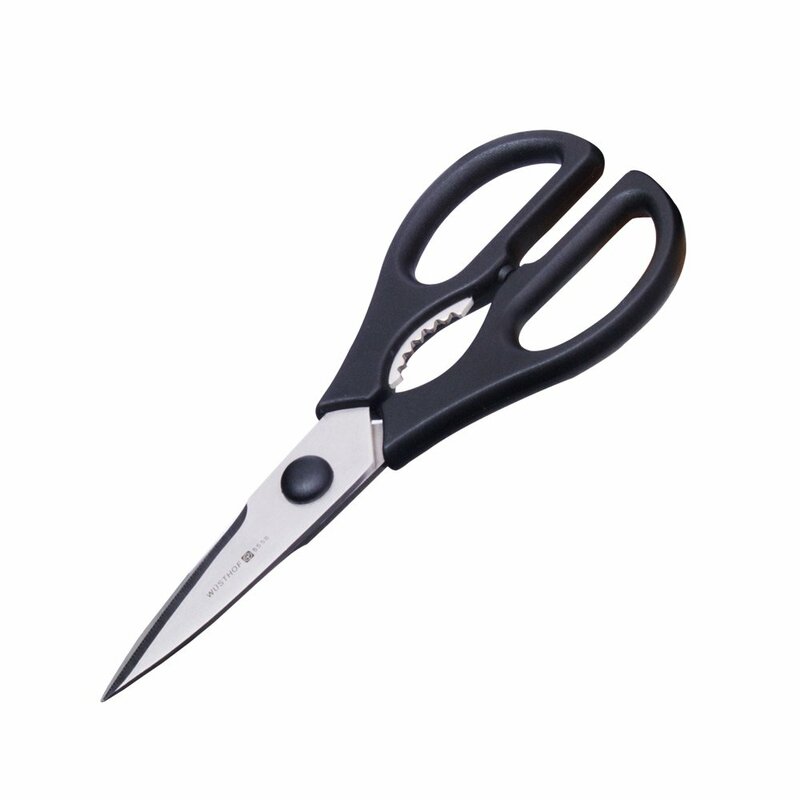 For home use, shears made from stainless steel is recommended as it is resistant to rust and stain and will last longer. Another thing to look for is the presence of mini-serrations on the blade. This simple feature can facilitate better grip, especially for slippery items. If you are left handed, it is important that you opt for kitchen shears that are properly balanced so it can be perfect for both lefts- and right- handed use. The handle of the kitchen shear must be suitable for your hand size and shape. 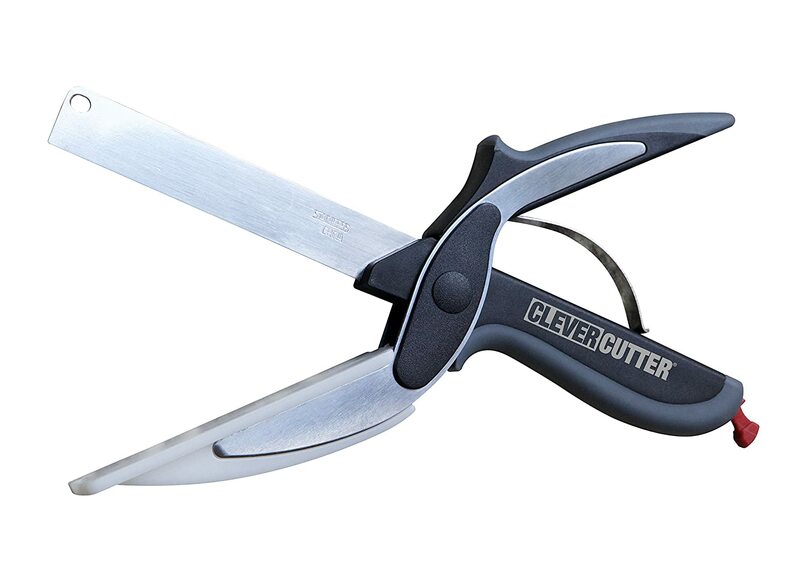 For a more comfortable and slip-free grip, kitchen shears with synthetic or rubber grip are highly recommended. Today, there are plenty of kitchen shears with multiple functions. Opt for ones that can also work as a nut cracker, bottle opener, jar opener and much more. This simple feature is necessary for locking the blades to prevent unwanted incidents and damage when the shears are not in use. The blades must be separated for easy cleaning, maintenance, and re-sharpening. The best place to store your kitchen shears is in a knife block. A knife block is designed to protect the blade of knives (and shears) from possible pitting and dulling that may come as a result of it being banged and rubbed against other materials in the kitchen drawer. When cleaning the shears, your priority should be bacteria. Since the meeting point of blade and handle has the most exposure to bacteria, you must thoroughly clean these parts with soap and water. Another thing that you should take into consideration is rust. To avoid this, you should shy away from placing it in the dishwasher and opt to manually wash it instead. Make sure that the item has completely dried before putting it back into the knife block. When you browse various shopping sites and cooking blogs, you will discover that there are plenty of kitchen shears that are available in the market. There are so many that it can be quite overwhelming to determine which one would best suit your needs. Considered to be high-quality kitchen shears by many, KitchenAid shears feature a stainless steel blade that is resistant to rusting and corrosion. The ultra-thick blades offer durability and strength like no other. It also has micro-serrations that prevent slipping, making cutting a lot more efficient and easier. The shears come with a plastic blade guard that keeps the blades scratch-free. But more than that, this protective cover is designed to prevent unwanted incidents which would come handy especially if you have a child at home. 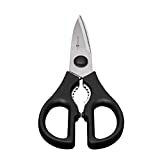 On the other hand, the handles of this kitchen shears are intricately designed and shaped to comfortably fit the fingers of the user. It also has a soft-grip coating that ensures stability when in use. For easy cleanup and maintenance, KitchenAid shears are made dishwasher safe, but for best results, hand washing is recommended. If you are looking for a kitchen shear that can perform plenty of functions, this is the kitchen shears for you. This multi-functional kitchen shear is heavy duty enough to replace knife in cutting meats and vegetables as well as trimming fats and removing chicken skin. More than that, it also acts as a bottle opener. In the comfortable grip handle, you can find a serrated section that can be used in removing bottle caps and cracking nuts. In addition to that, one side of the blade features a pop-top bottle openers that are perfect for opening jars. 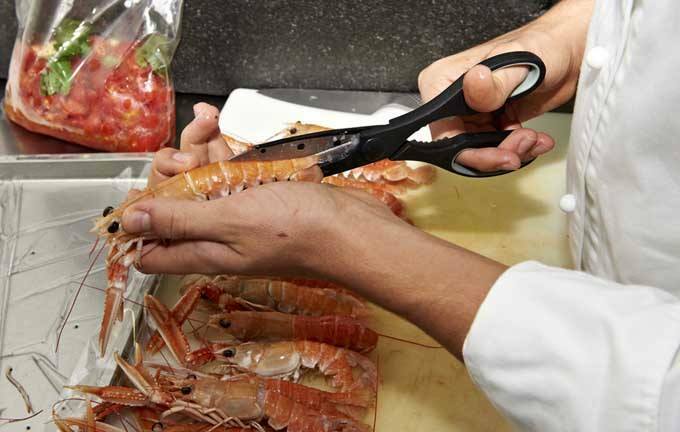 The kitchen shears are well known for its corrosion and rust resistant blades with micro-serrated edges that ensure slip-free cutting experience. It also boasts of comfortable grip handles that are perfect for both left- and right- handed users. As proof of its high quality, its maker offers a 100% money back lifetime guarantee for every purchase of this item. From one of the leading makers of kitchen utensils, the Wusthof 5558-1 kitchen shears are here to put all the other shears to shame. Designed with functionality in mind, this kitchen shear can be held using either right or left hand. It also boasts of other features. For one, the handle has steel tooth insets that can be used to twist open jar and bottle caps. The handle can also be used to crack nuts with ease. The blades are made of high-carbon stainless steel that is curved inward to facilitate exact and smooth cutting action. It is dishwasher safe, but hand wash is recommended. In addition to its functionality, the Wusthof Kitchen Shears are also well-known for offering utmost convenience when it comes to cleanup and maintenance. This is because its blades can be taken apart which makes thorough cleaning a whole lot easier. The blades can also be detached from its body which allows the user to sharpen the blades hassle-free. Considered to be one of the nicest kitchen shears in the market, J.A. 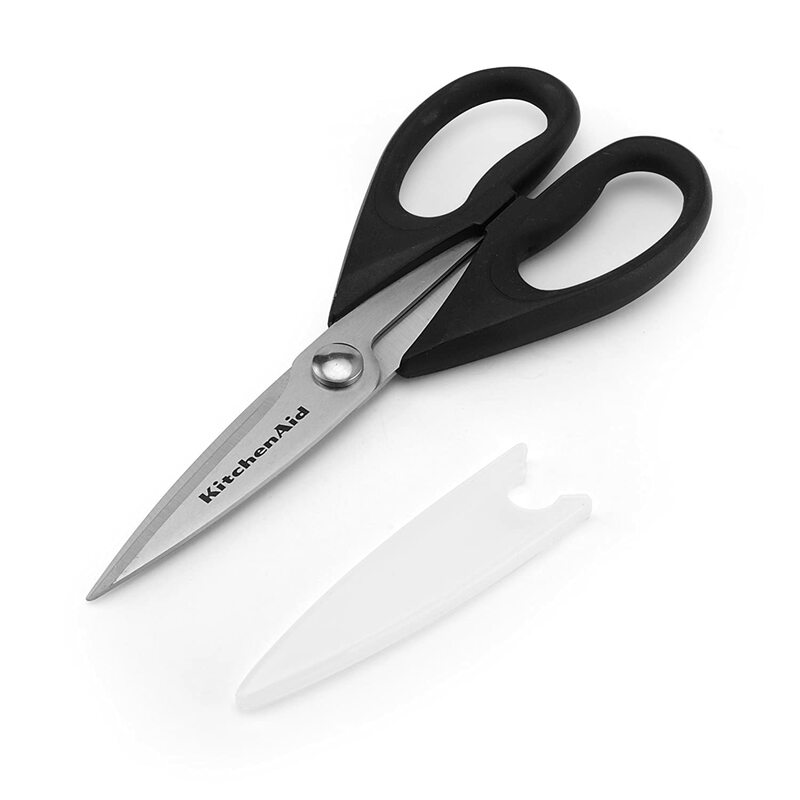 Henckels Kitchen Shears live up to its title with its micro-serrated blade (perfect for slip-free cutting) that is made from a high-quality corrosion and rust resistant stainless steel material. 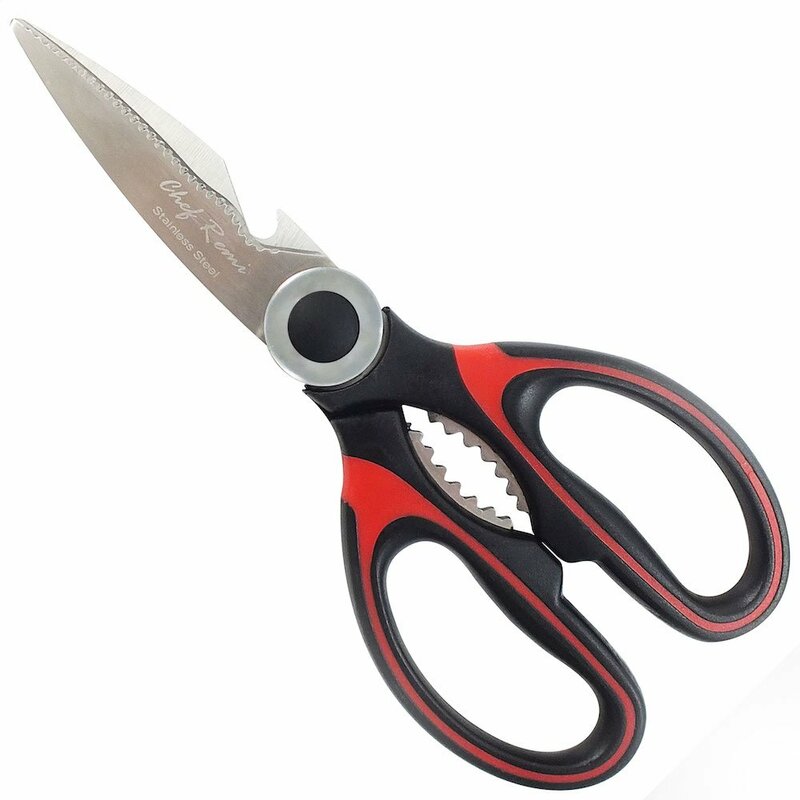 The thick and durable blades make the shears useful for various cutting tasks. The handle is designed to be used by either left- or right-handed users. The center area between the blade and the handle features a metal inset that can open bottle caps. On the other hand, the handle features a serrated metal inset that can be used in opening screw caps and cracking nuts. The kitchen shear come with a limited lifetime manufacturer warranty that is only applicable for defective products only. It is dishwasher safe, but manufacturer advises hand washing it instead. Here’s a kitchen shear that features a smart and innovative design like no other. Considered to be a 2-in-1 product, the chopper features not just a knife but a cutting board as well. It may seem like a regular scissor, but one blade resembles a knife while the other is also sharp enough to cut through food items plus it has a small board platform where you can place the items that need to be cut. The chopper features an anti-slip design for a safe cutting experience. The blades are made of high-quality stainless steel that is durable and can be cleaned in the dishwasher. It is also resistant to corrosion, staining and rusting. But above it all, Clever Cutter is designed with the safety of user in mind. 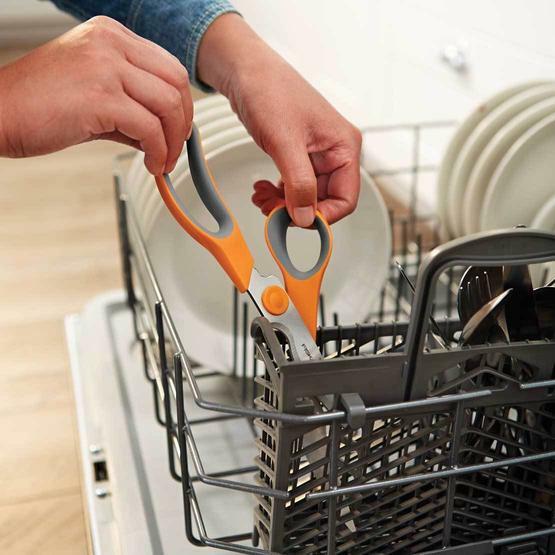 The cutter features a safety hinge which can be locked to prevent accidental cuts and damage to the drawer while in storage. There are plenty of brands, types, and styles of kitchen shears out there and not all of them are created equal. When you take a look at the reviews of the 5 kitchen shears that we have above, you will see that almost all of them have the qualities that you should look for in a kitchen shear—comfortable grip, micro-serrated stainless steel blade, proper balance and multi-functional. So which is the best kitchen shears for you? If budget is not an issue, the Wusthof 5558-1 Kitchen Shear is your best bet because its blade is made of a mixture of stainless steel and carbon material that is designed for durability and stain resistance, so you are assured that it will last for long. But if you will prioritize value and practicality, your next best options are J.A. Henckels International Kitchen Shears and Chef Remi Kitchen Shears. These two also offers good quality at a much affordable price! Did you find this article useful? If yes, please do share it with your friends so we can help them find the perfect kitchen shears too. If you have questions or feedbacks, please leave a comment, and I will keep in touch with you there! Can You Freeze Smoked Salmon? Know The Amazing Answer Here! What Does Trout Taste Like? The Tasty Truth You Need To Know! What Does Walleye Taste Like? Find Out the Surprising Answer You Need To Know! What do Scallops Taste Like? Find Out For The Amazing Flavor of the Sea!